Today I share West's Black Swan Dreaming of her past life Lilith story. These stories are often keys that unlock the door we are craving to open to come home and be with others again, to be whole again in ourselves. Our Lilith stories are our memories of the Wild Feminine and how she became outcast - it is a story we often feel but find it hard to express in words. The Black Swan comes to journey with the Lilith story and it is her gift for story and words that help you to find your own mythic tale and the lyrics to sing back your long lost Wolf Sister. Thank you West for sharing your heart and words, oceans of love to you and your wild sister as you journey together now. You can read more about these sessions here. As the journey started I walked into the forest the green light blurred. I looked up, the foliage had disappeared and a thin green membrane was above me, held up by hundreds of solid black tree trunks that disappeared into the murkiness. I started to walk into the forest but as I walked, I moved backward; every step I took dragged me back. Eventually I was blown back and I realized that the forest I was in was actually a dragon’s eye. It was Lilith’s eye. The trees were veins and the green the membrane was her skin. As I realized this I tumbled out and came face to face with her. As we walked she donned a giant wooden mask, half wolf and half horse. The mask was stylized, thick lines and blocks of colour – red, green, white and blue. She wore a cloak made of moss and sticks. She stalked like a shaman steeped with magic; dancing her way through the night. We were crossing a frozen tundra together. We were in the Arctic. There was an ice-wall ahead and the Aurora Borealis danced wild green above our heads. She whispered that the Aurora Borealis were the ghost of the forests that had been. Suddenly the sky cracked and an ice-water waterfall flowed down; glacial shards piercing the tundra like flesh. The world peeled away. I found myself alone and looking in to a dark pool. The air was painful on my skin. Lilith was looking back at me from in the pool. I wanted to ask where she had gone; how had she got to the other side of the water? I missed her but I was scared. Suddenly, a white paw shot out of the water and dragged me down into the pool. The pool was a portal. Once again I stood beside Lilith on the tundra however, I knew we were on the other side of the pool; like stepping through the looking glass, I guess. It was daylight now and the air sparkled with the cold. Looking up I saw we had broken the ice-wall. Just our presence changed things. Lilith was a Shapeshifter and Shifter of Shapes; a catalyst for change. Lilith and I walked on through the ice crevices. I marveled at the whites and blues. The next thing I knew I was looking down at a grave; my grave from a past life. The grave was open and it was all bones and dirt and a mess of long black hair. Some of the leather clothing remained but it was stained red. I looked down at the broken and dry bones with curiosity and compassion. Lilith stood beside me in reverent silence but I could sense her silent howls. She wanted me to get going. What was I to get going on? I looked down at the bones of the young girl’s hands, my hands, they were clutching a brilliant ruby red heart. If you caught the heart in the right light you could see a foxes face in the ruby. Once I was healed I came face to face with my Wildling Self. Lilith watched over us as we stepped into one another and merged – becoming one. In the background was my Polar Bear Clan, they just watched. I loved my Polar Bear Clan but I could never return. I was too different. I needed to find my own clan. I needed to run wild. I needed balance of togetherness and aloneness. I could not pledge to any person. However, the Polar Bear Clan had promised to always protect me from a distance. Their protection and power echoed down through history affording me great strength and safety. I was marked with the paw. This taught me about forgiveness, letting go, and love. I had a sudden feeling of being home. My whole body relaxed... she was home. We were home; the medicine of death, of threshold and transformation, wildness, and creation shining brilliant in my heart, Lilith at my side ready to return. And so the next journey begins – to know my medicine, to honour it well, and to be with others when the time is right while taking the time to hibernate with my beasts, the bones, and the soil when needed… and to run thresholds… to celebrate the my darkness, to realize and embrace myself and embrace Lilith. Custom Spirit Dolls for Summer Solstice - I am taking the last orders now for dolls to be made handcrafted for you or a loved one in time for solstice or christmas. These dolls are made with your intentions, animal totems and plant medicine - they come with a reading from your Spirit Sister. $100 including postage - send me a message to place your order. KOALA: Koala is a marsupial that lives high up in the gumtrees and is native to only Australia. The koala teaches us about the importance of rest and sleep. It's medicine is of the Dreamer. It comes to us when we need to take time out of 'busyness' and relax. If the Koala has been making itself known to you through dreaming and meditation it may be because there has been too much worrying, which can make the mind race in circles and lead to exhaustion. Let the Koala show you how to step back from your worries and just BE. Not all problems can be solved through the mind, some of our greatest breatkthroughs in difficult situations come through our Dreaming. Koala would urge you to rest - can you make time for a nap today or even better, embrace in a long, deep period of sleep. These photographs were taken last year at the Southern Ash Wildlife Shelter in Victoria an incredible volunteer animal shelter run by Colleen Wood and her amazing team who work without any funding or assistance from the government. Colleen is the leading expert on koala care and welfare in Australia and she would be so grateful for any assistance and donations you can spare to help care for these beautiful animals that are unfortunately in so much danger due to expanding urban environments and man-created diseases. Did you know that you can sponsor one of these gorgeous creatures for just $40?! Colleen's aim is to help as many koalas come to full healing and be returned again to the wild. You can find out more about the work of Southern Ash at their website and on their Facebook page. Otter is the totem animal of my clan, of my ancestors. Here she is dancing in the waterfall. Revelling in the meeting of the elements of water and stone. Hello Sister Otter, sister of my wild heart. What animal feels closest to your own spirit? An animal that was known to your ancestors and is given as a gift to you? Trust your knowing and intuition, ask for your Clan Totem to make itself known in your meditations, reverie and dreaming. Ask for a symbol from this animal and from your clan. A symbol that with love and intention can become a potent talisman for you on your journey. Something that can be etched into jewellery, sewn into clothing, written on paper, and perhaps even inked onto your skin. A totem talisman to help you to remember who you are, who came before you and the natural gifts that are your birthright to express again. This Week's Familiar is KANGAROO. Kangaroo: The kangaroo has come through this week to show us how to let go of stress. We can often let stress build up in us over issues and events that aren't as important as we think they are. Here is an exercise taught to me by kangaroo: imagine a large kangaroo standing in front of you and focus on what you are feeling stressed about. Begin taking very deep breaths. With every exhale see the kangaroo in front of you growing larger and larger as you let the problem go. When the kangaroo has taken the feeling of stress from you it will turn and jump in enormous leaps - releasing the energy of the issue with every jump until it is completely clear. This is kangaroo's gift to you. 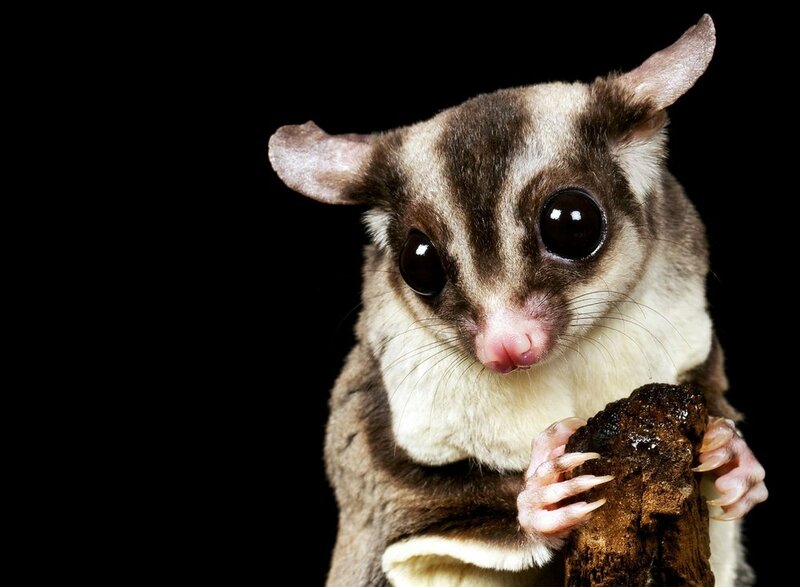 Sugar Glider teaches us to take a leap of faith without any fear. The Sugar Glider leaps from tree to tree to create it's own path where there is seemingly no path at all. It likes to be at the highest part of the tree and at that height has a much greater perspective than other creatures. It will take a chance to jump onto a new tree when it wants the change. When the Sugar Glider comes to us it's medicine is helping us to try new ways to change the old. It encourages us to have faith and confidence to reach new heights. The Sugar Glider is a wingless creature that can fly through the air - have you been told that you don't have the skills or gifts to achieve your dreams? Be like the Sugar Glider and believe in yourself, take yourself to the highest vantage point and leap! We create our own adventure. This week's Familiar is EMU. Emu: The emu is a very inquisitive bird. It's message is one of constant learning and searching all avenues. For emu, it does not matter who is teaching as long as we are learning, therefore the emu shows us that we are all student and all teachers in one way or another. The emu shows us there is never just one way to go, not one path but many. By gathering and learning as you go, you make your own path to follow. Treat everyone and everything as a teacher and embrace learning, in doing so you will create a path that is right for you and will become the teacher for yourself. The Emu. This week's Familiar is KOALA. Koala: The koala has come in this week with it's message about relaxation. Koala is one of my totems and has taught me about the importance of relaxing and just taking it easy. This message is reminding us to set aside time to do nothing and let the world go by for a change. The koala helps us to de-stress as stress can often be a major cause of illness. How much time are you giving to stressing about the tiny details of your day? Is your mind racing constantly? Are you taking time for yourself? What is it that relaxes you the most and can you make time to do this more? The irony is we are more productive when we are relaxed. So make time to embrace the energy of the koala today and let go, relax and be. The Koala. These are the beautiful koalas at The Southern Ash Wildlife Shelter - you can sponsor a koala for just $40 and they need our love and help. Here is a link to sponsor a koala.